What primarily defines the strange in technique must be identified as the questionable in ambition. To those posting their businesses advertisements on Facebook groups, the aim is obvious. Exposure is an appealing prompt to join a group and put up a wall post or two. The common spamming practice of business owners joining random groups to throw their advertisements wherever there are eyes is easily understood, if questionably ethical, while the pages designed to cater to these advertising campaigns is less comprehensible. Public Facebook groups with distinctly unsubtle names like “advertise your business here”(absence of capital letters kept faithful to the source) are surprisingly common, since they serve little good to those who post and literally none to the administrators of the group itself. Growing a subscriber base for a Facebook group without a call to action and a dearth in devoted user community serves no purpose other than the sake of growing itself. While whatever mostly ignored exposure for enterprising group members may be garnered, what benefit does the group creator reap? Thanks to Weight Loss Solutions for providing this lovely example on our blog for us to criticize. 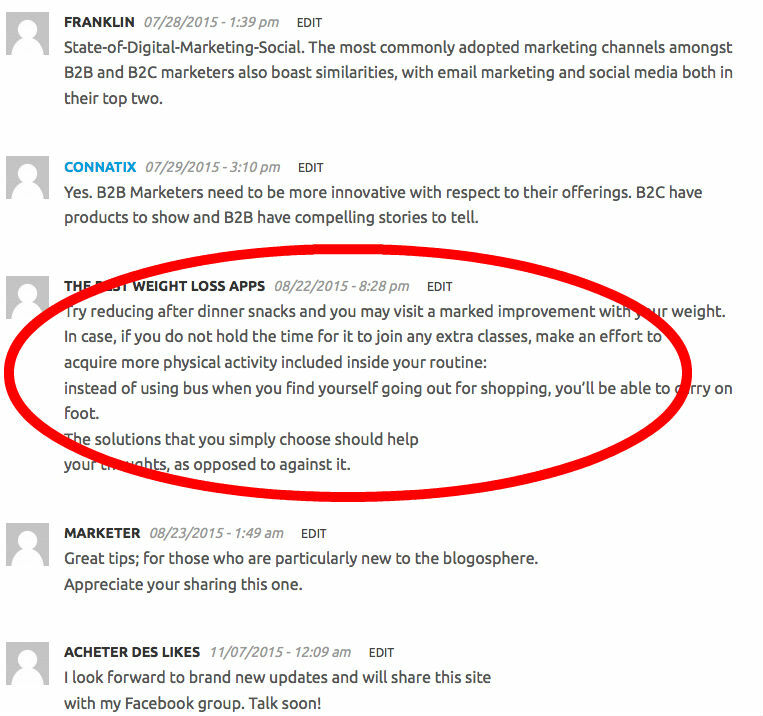 What did that have to do with B2B v. B2C digital marketing techniques (the article this was posted under)? Absolutely nothing- but that doesn’t stop comment spammers from posting appeals for their new weight loss apps on our comment sections. But the approach isn’t only abused under the posts of brilliant marketing blogs. YouTube videos were plagued with this technique as well until the company took specific actions to combat it. Smaller organizations however, which cannot utilize the support structure of a major company like YouTube, still suffer under this pedestrian method. Mega-domains of interconnected forums such as Reddit are immensely popular, and strictly defended. But that doesn’t stop the less than perfectly clandestine insertions of promotions by advertisers who fail to understand internet culture. The ambition is plain and even understandable, but it shows an an uncomfortably plain misunderstanding when misplaced ads wind up tacked unceremoniously onto irrelevant content posts. While it is clear how they intend to profit here, it is beyond doubtful that they would convert even a single click into revenue. What other ad techniques make you roll your eyes online? Let us know in our comment section below, check out our useful Facebook page, or visit our website.